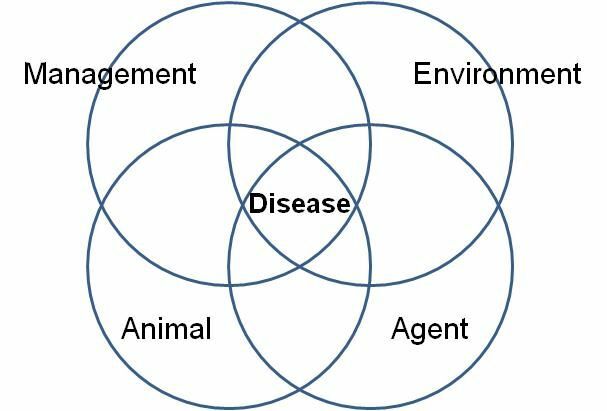 Investigating disease events is made simpler if placed in the context of a conceptual framework to which there are three parts. Resistance versus exposure to pathogens. Resistance versus exposure. Disease in an animal occurs when there is a reduction in the animal's resistance to disease-causing agents (called pathogens), or an increase in the animal's exposure to pathogens. If resistance declines or exposure increases, or both, then there is a risk that disease will occur as shown schematically in Figure 2.1. Pathogens include organisms such as bacteria, viruses or internal parasites. Many factors such as heat, cold, toxins, stress or nutrient deficiency may also cause disease or predispose animals to diseases caused by pathogens or other factors. Examples of situations where an animal's resistance is lowered are physical exhaustion, constant fear and anxiety, undernutrition or concurrent disease. Individually or in combination these may compromise the body's immune system. Examples of situations where exposure to pathogens is increased are crowding, mixing of animals of different origins, inadequate ventilation, unhygienic environmental conditions and contamination of food and water. Therefore, to stop the disease event and prevent its occurrence, efforts must be directed at increasing the animal's resistance through measures such as administering vaccines, prophylactic antibiotics, and providing rest, improved nutrition, shelter and relief from social or physical stresses. Efforts may also be directed at reducing exposure to pathogens such as by improving hygiene and ventilation, reducing crowding, providing shelter or alternative sources of feed or water. Often efforts are directed simultaneously at both types of measures. 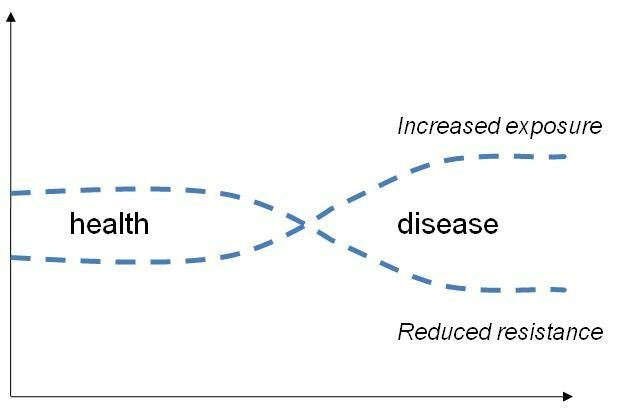 The multifactorial nature of disease. The second concept is that all disease events are multifactorial. This means that multiple factors must combine to cause a disease event as shown schematically in Figure 2.2. They combine to create the situation in Figure 2.1, by lowering resistance or increasing exposure or both. The factors fall into the categories of management, environmental, animal and agent factors. A library of management, environmental and animal risk factors that may combine at sea to cause disease is presented in List 2.1. Of the four categories of risk factors, management factors are probably the most important to focus on when a disease event needs to be stopped and prevented from recurring in the short term. This is because one can often change management factors quickly but not so the environmental or animal factors. Environmental and animal factors can be changed, but usually slowly and not in the time frame of the disease event at hand. Check the library of risk factors in List 2.1 and see if this makes sense. Clustering of cases and non-cases. In disease events affecting multiple animals, cases tend to cluster in time, space and in terms of animal characteristics. Non-cases (those animals unaffected by the disease event), cluster similarly. The clusters may give important clues for determining factors that might be contributory. Non-cases can be as important as cases, often serving to narrow down the number of differential diagnoses and tighten theories on cause. Disease mapping can be used to define the clustering that may occur in disease outbreaks. The best way to map cases and non-cases in time, space and animal characteristics is to use a time-line to mark when they occurred, a map to mark where they occurred, and a table to identify associated characteristics.